Each year the St. Louis Arc and Belle Children’s Services put on a fun and lighthearted Trivia Night. The event has grown tremendously since it debuted in 2002 and every year there is a new theme. Cash prizes are awarded for 1st, 2nd and 3rd place teams. There are also attendance prizes, a silent auction, 50/50 and Mulligans! 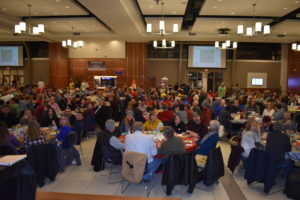 Our 2019 Game Night Trivia Night brought 630 guests and raised more than $34,000! Thank you to all our various sponsors, donors, and volunteers who made the night possible. For more information, to become a sponsor, or to make a silent auction donation for the next Trivia Night, Tessa Klassen, Special Events Manager, at 314-817-2241.